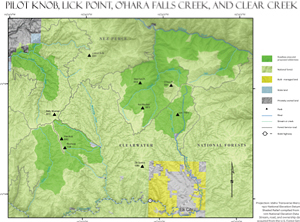 The 33,000 acres that make up O’Hara – Falls Creek Roadless Area sit adjacent to Lick Point Roadless Area, southwest and below Rackliff – Gedney Roadless Area, and is roughly southeast of Highway 12. The region contains all of the O’Hara Creek drainage and the southside breaks of the Selway River for about 10 miles upstream from the mouth of O’Hara Creek. The topography is typical of lower Selway country: steep slopes, though not highly dissected. Elevation ranges from 1,600 feet on the Selway at the north boundary to over 6,000 at the peaks of West Fork Point and Iron Mountain to the west. Profuse vegetation covers most of the area, ranging from dense, mixed species of timber that open up around the ridges to thick brushfields that are the regrowth from past fires. Fragrant cedar are prolific in the creek bottoms; in the wet, shady draws ferns stretch over the explorer’s head, filtering sunlight and lending a prehistoric milieu to the forest trek. Underfoot one can find several sensitive plant species such as Payson’s milkvetch, Constance’s bittercress, Pacific Dogwood, clustered lady’s-slipper, and evergreen kittentail. O’Hara Creek is a constantly evolving watercourse, flanked by small clearings in places. Anadromous fish inhabit the clear water, accompanied by other native species and long-ago planted eastern brook trout which unfortunately compete with native bull trout. Saddle Creek winds through the eastern sector, cascading through a steep, rocky gorge with waterfalls and pools. The canyon opens in the upper section of Saddle Creek to grassy meadows and beaver ponds. In addition to several Region 1 sensitive amphibian species, deer, elk, bear, and moose rove this lush country. Hunting pressure is light due to the challenging nature of the terrain and difficult access over existing trails. 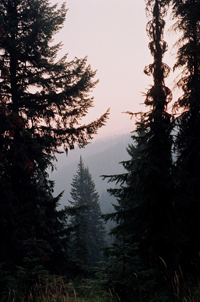 While many visitors float or fish the Selway, few venture very far into this roadless area. Therefore, while the existing trails are often hard to find or traverse because of disuse, one can find solitude among the varied terrain. Iron Mountain, the highest point, is composed of magnetic iron evidenced by the frequent lightning strikes there during thunderstorms. The area was mined in the past, leaving behind overgrown sinkholes just outside the roadless area. A .25 mile protected corridor runs 2,900 acres along the Selway River under the Wild & Scenic Rivers Act. A 6,600 acre Research Natural Area established in 1980 is entirely within the region, emphasizing the unique drainage as the best known representation of several lower Lochsa/Selway characteristics, including coastal-disjunct species like the rare Pacific dogwood. Recognized as an irreplaceable ecological and wilderness contribution, O’Hara – Falls Creek is a prime candidate for full protection and preservation.